Local artist creates an invisible car! 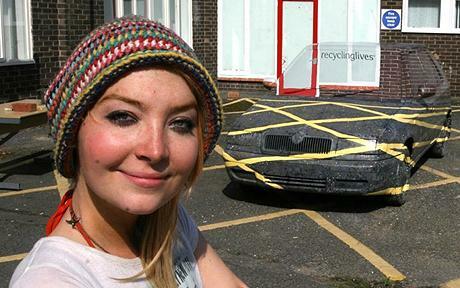 Sara Watson, an art student from Ashton under Lyne, has found the ultimate way of avoiding traffic wardens – by making her car invisible. Her work, created as part of her drawing and image making course at the university, creates the illusion that the car is see through. She was given the car from a breakers yard and worked for three weeks to ensure that it blended perfectly with its surroundings. “I was experimenting with the whole concept of illusion but needed something a bit more physical to make a real impact.” said Miss Watson. The car is reminiscent of the work by pavement artist Julian Beever, whose attempts to trick people’s minds into seeing perspective on the flat surfaces of paving stones.